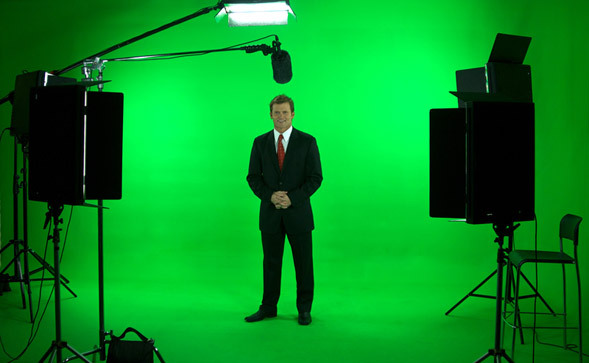 Green screen use in video production is a common and highly effective process for improving the quality of the footage. You only have to turn on the weather channel to see the famous green screen to weather map background in action. All the latest film makers use green screen techniques to make tasks like taking Jennifer Lawrence up into space and building a Game of Thrones size army with minimal actors more cost effective, particularly for producers. At such a high quality it is easy to forget what you are watching is not actually real. Known otherwise as Chroma Key compositing, it is not just for million pound production budgets and live weather reports. As more businesses engage with video, whether it be for internal communications or wide scale social media marketing, green screen use during filming can help build more interesting and ‘watchable’ content. Green screens are used to fabricate any number of different visual backgrounds without having to change filming location. A subject can be filmed in a studio and then post-production can take them wherever desired, real or otherwise, by altering the background. This special effects technique simply subtracts the colour green and replaces it with either a still or moving image. Depending on the technology and hardware involved, this can be done either live or in post-production. In the original video footage a colour is made transparent so that it can then be replaced by existing background images or video. The most prevalent colour choices for Chroma Key screens are green or blue, because they are the furthest away from human skin tones on a colour chart. With other colours, for example a red screen, features in the face of your subject will begin to disappear during filming or whilst editing in post-production, as they are picked up by the camera or interpreted by the editing software. Regardless of whether you decide to use green or blue screen, make sure you avoid that same colour in your shoot. This includes clothing, accessories (jewellery, makeup or hair colour), furniture and props. Whilst Chroma Key is an effective technique, it is not intelligent enough to decipher the difference between anything similar in colour. If you are using a green screen and your subject is wearing a green jumpsuit, you’ll end up with a transparent body and what appears to be a floating head! However, don’t let this deter you. If you want minimum expenditure and don’t have access to a professional studio, you can still film anywhere regardless of the background. If you want to remove clutter which shows your untidy work desk, using a green screen allows you to replace it with an image of a tidy office, or perhaps a view of your city skyline. Regardless of subject matter, company videos can use Chroma Keying to help compose still or moving images or motion graphics in order to assist the narrative of any story. Having been around since the 1940’s, Chroma Keying continues to grow in popularity as technology improves and visual effects become more believable. Whilst the theory is relatively straight forward, in practice the outcome of your Chroma Key productions will depend on forward thinking, know-how and experience. For help starting out using a green screen, see our top tips below. Purchase: Start small. You can buy relatively inexpensive pop up green screens online for under £50. These come in a circular form but ‘pop out’ to around 1.5 x 2 meters when unzipped from their bag (think modern tent design). Most online retailers and filming specialists stock green screens in a variation of sizes, colours, quality and cost. As long as you know the size of background you need to cover, purchasing a suitable screen is easy and does not have to blow your budget. Lighting: Before you start filming have a look at how your superimposed background has been lit and try your best to emulate this lighting when you shoot your subject(s). Giving this careful consideration will pay dividends after. If the two lighting levels don’t match, your final composition will appear ‘photoshopped’, like someone has been stuck on top of an image without any thought. Failing this then some clever colour adjusting in post-production can help match two scenes together; it just takes knowledge and practise. Camera: Similar matching concerns to lighting, the depth of field for both your foreground and background video or image should be the same. Apps: For smart phones, apps like DoInk and Veescope Live are great for green screen filming and let you upload your own videos and images from your device.